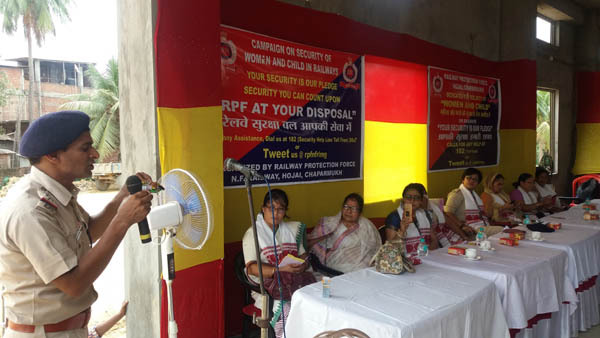 Railway Protection Force Charparmukh and Hojai jointly organized an awareness campaign at Hojai Railway Stationon Saturday. The awareness campaign was on the safety of the women and child passengers. The campaign received huge participation of women. The people were also informed about the toll-free number 182 set up for women’s security. The meeting was presided by Renu Kakoti, President,Hojai Zila Mahila Kalyan Committee. Hojai DSP Bhanita Nath, P. Daimary, Inspector RPF Charparmukh along with many other guest’s were present on the occasion. The campaign aims to ensure security of women and child passengers, who generally face inconvenience during their journey. Speaking on the occasion Panchu Ram Meena, Sub-Inspector, RPF Hojai explained how while travelling one needs to be alert. He distributed soft drinks, biscuits and warned against accepting food items from strangers. He also requested one should not befriend strangers while in a train. He further informed that in 2018 RPF is organizing such events nationwide to create mass awareness. Everyone present praised Railway Protection Force for organizing such significant awareness campaign. A procession with banner and placards of women and child safety was carried out at Hojai Railway Station followed by pamphlets distribution on tips for safe train journey and nirbhaya card by the RPF among the passenger’s.